"Benedictine" redirects here. For the Orthodox Benedictines, see Order of Saint Benedict (Orthodox). For the Anglican order of the same name, see Order of St. Benedict (Anglican). For other uses, see Benedictine (disambiguation). The Order of Saint Benedict (OSB; Latin: Ordo Sancti Benedicti), also known – in reference to the colour of its members' habits – as the Black Monks, is a Catholic religious order of independent monastic communities that observe the Rule of Saint Benedict. Each community (monastery, priory or abbey) within the order maintains its own autonomy, while the order itself represents their mutual interests. The terms "Order of Saint Benedict" and "Benedictine Order" are, however, also used to refer to all Benedictine communities collectively, sometimes giving the incorrect impression that there exists a generalate or motherhouse with jurisdiction over them. 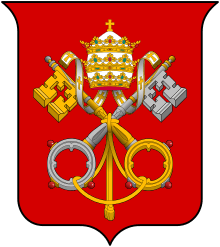 Internationally, the order is governed by the Benedictine Confederation, a body, established in 1883 by Pope Leo XIII's Brief Summum semper, whose head is known as the Abbot Primate. Individuals whose communities are members of the order generally add the initials "OSB" after their names. Saint Benedict of Nursia (c. 480–543). Detail from a fresco by Fra Angelico (c. 1400–1455) in the Basilica San Marco, Florence. The monastery at Subiaco in Italy, established by Saint Benedict of Nursia circa 529, was the first of the dozen monasteries he founded. He later founded the Abbey of Monte Cassino. There is no evidence, however, that he intended to found an order and the Rule of Saint Benedict presupposes the autonomy of each community. When Monte Cassino was sacked by the Lombards about the year 580, the monks fled to Rome, and it seems probable that this constituted an important factor in the diffusion of a knowledge of Benedictine monasticism. It was from the monastery of St. Andrew in Rome that Augustine, the prior, and his forty companions set forth in 595 on their mission for the evangelization of England. At various stopping places during the journey, the monks left behind them traditions concerning their rule and form of life, and probably also some copies of the Rule. Lérins Abbey, for instance, founded by Honoratus in 375, probably received its first knowledge of the Benedictine Rule from the visit of St. Augustine and his companions in 596. Gregory of Tours says that at Ainay, in the sixth century, the monks "followed the rules of Basil, Cassian, Caesarius, and other fathers, taking and using whatever seemed proper to the conditions of time and place", and doubtless the same liberty was taken with the Benedictine Rule when it reached them. In Gaul and Switzerland, it supplemented the much stricter Irish or Celtic Rule introduced by Columbanus and others. In many monasteries it eventually entirely displaced the earlier codes. By the ninth century, however, the Benedictine had become the standard form of monastic life throughout the whole of Western Europe, excepting Scotland, Wales, and Ireland, where the Celtic observance still prevailed for another century or two. Largely through the work of Benedict of Aniane, it became the rule of choice for monasteries throughout the Carolingian empire. Monastic scriptoria flourished from the ninth through the twelfth centuries. Sacred Scripture was always at the heart of every monastic scriptorium. As a general rule those of the monks who possessed skill as writers made this their chief, if not their sole active work. An anonymous writer of the ninth or tenth century speaks of six hours a day as the usual task of a scribe, which would absorb almost all the time available for active work in the day of a medieval monk. In the Middle Ages monasteries were often founded by the nobility. Cluny Abbey was founded by William I, Duke of Aquitaine in 910. The abbey was noted for its strict adherence to the Rule of St. Benedict. The abbot of Cluny was the superior of all the daughter houses, through appointed priors. 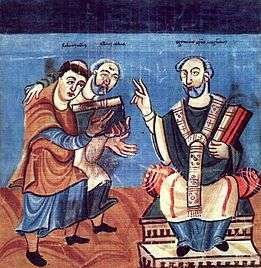 One of the earliest reforms of Benedictine practice was that initiated in 980 by Romuald, who founded the Camaldolese community. The English Benedictine Congregation is the oldest of the nineteen Benedictine congregations. Augustine of Canterbury and his monks established the first English Benedictine monastery at Canterbury soon after their arrival in 597. Other foundations quickly followed. Through the influence of Wilfrid, Benedict Biscop, and Dunstan, the Benedictine Rule spread with extraordinary rapidity, and in the North it was adopted in most of the monasteries that had been founded by the Celtic missionaries from Iona. 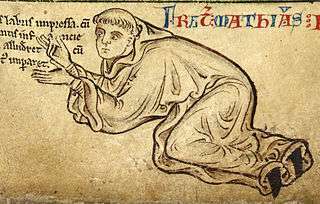 Many of the episcopal sees of England were founded and governed by the Benedictines, and no less than nine of the old cathedrals were served by the black monks of the priories attached to them. Monasteries served as hospitals and places of refuge for the weak and homeless. The monks studied the healing properties of plants and minerals to alleviate the sufferings of the sick. Germany was evangelized by English Benedictines. 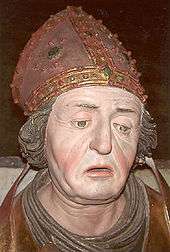 Willibrord and Boniface preached there in the seventh and eighth centuries and founded several abbeys. In the English Reformation, all monasteries were dissolved and their lands confiscated by the Crown, forcing their Catholic members to flee into exile on the Continent. During the 19th century they were able to return to England, including to Selby Abbey in Yorkshire, one of the few great monastic churches to survive the Dissolution. St. Mildred's Priory, on the Isle of Thanet, Kent, was built in 1027 on the site of an abbey founded in 670 by the daughter of the first Christian King of Kent. Currently the priory is home to a community of Benedictine nuns. Five of the most notable English abbeys are the Basilica of St Gregory the Great at Downside, commonly known as Downside Abbey, The Abbey of St Edmund, King and Martyr commonly known as Douai Abbey in Upper Woolhampton, Reading, Berkshire, Ealing Abbey in Ealing, West London, St. Lawrence's in Yorkshire (Ampleforth Abbey), and Worth Abbey. Prinknash Abbey, used by Henry VIII as a hunting lodge, was officially returned to the Benedictines four hundred years later, in 1928. During the next few years, so-called Prinknash Park was used as a home until it was returned to the order. Since the Oxford Movement, there has also been a modest flourishing of Benedictine monasticism in the Anglican Church and Protestant Churches. Anglican Benedictine Abbots are invited guests of the Benedictine Abbot Primate in Rome at Abbatial gatherings at Sant'Anselmo. There are an estimated 2,400 celibate Anglican Religious (1,080 men and 1,320 women) in the Anglican Communion as a whole, some of whom have adopted the Rule of St. Benedict. As of 2015, the English Congregation consists of three abbeys of nuns and ten abbeys of monks. Members of the congregation are found in England, Wales, the United States of America, Peru and Zimbabwe. The forty-eighth rule of Saint Benedict prescribes extensive and habitual "holy reading" for the brethren. Three primary types of reading were done by the monks during this time. Monks would read privately during their personal time, as well as publicly during services and at meal times. In addition to these three mentioned in the Rule, monks would also read in the infirmary. However, Benedictine monks were disallowed worldly possessions, thus necessitating the preservation and collection of sacred texts in monastic libraries for communal use. For the sake of convenience, the books in the monastery were housed in a few different places, namely the sacristy, which contained books for the choir and other liturgical books, the rectory, which housed books for public reading such as sermons and lives of the saints, and the library, which contained the largest collection of books and was typically in the cloister. The first record of a monastic library in England is in Canterbury. To assist with Augustine of Canterbury's English mission, Pope Gregory the Great gave him nine books which included the Gregorian Bible in two volumes, the Psalter of Augustine, two copies of the Gospels, two martyrologies, an Exposition of the Gospels and Epistles, and a Psalter. Theodore of Tarsus brought Greek books to Canterbury more than seventy years later, when he founded a school for the study of Greek. Monasteries were among the institutions of the Catholic Church swept away during the French Revolution. Monasteries were again allowed to form in the 19th century under the Bourbon Restoration. Later that century, under the Third French Republic, laws were enacted preventing religious teaching. The original intent was to allow secular schools. Thus in 1880 and 1882, Benedictine teaching monks were effectively exiled; this was not completed until 1901. The first Benedictine to live in the United States was Pierre-Joseph Didier. He came to the United States in 1790 from Paris and served in the Ohio and St. Louis areas until his death. The first actual Benedictine monastery founded was Saint Vincent Archabbey, located in Latrobe, Pennsylvania. It was founded in 1832 by Bonifice Wimmer, a German monk, who sought to serve German immigrants in America. In 1856, Wimmer started to lay the foundations for St. John's Abbey in Minnesota. By his death in 1887, Wimmer had sent Benedictine monks to Kansas, New Jersey, North Carolina, Georgia, Florida, Alabama, Illinois, and Colorado. Wilmer also asked for Benedictine sisters to be sent to America by St. Walburg Convent in Eichstätt, Bavaria. In 1852, Sister Benedicta Riepp and two others sisters founded St. Mary's in Pennsylvania. Soon they would send sisters to Michigan, New Jersey, and Minnesota. By 1854, Swiss monks began to arrive and founded St. Meinrad Abbey in Indiana, and they soon spread to Arkansas and Louisiana. They were soon followed by Swiss sisters. There are now over 100 Benedictine houses across America. Most Benedictine houses are part of one of four large Federations: American-Cassinese, Swiss-American, St. Scholastica, and St. Benedict. The federations mostly are made up of monasteries that share the same lineage. For instance the American-Cassinese Federation included the 22 monasteries that descended from Boniface Wimmer. Today, Benedictine monasticism is fundamentally different from other Western religious orders insofar as its individual communities are not part of a religious order with "Generalates" and "Superiors General". Rather, in modern times, the various autonomous houses have formed themselves loosely into congregations (for example, Cassinese, English, Solesmes, Subiaco, Camaldolese, Sylvestrines) that in turn are represented in the Benedictine Confederation that came into existence through Pope Leo XIII's Apostolic Brief "Summum semper" on 12 July 1883. This organization facilitates dialogue of Benedictine communities with each other and the relationship between Benedictine communities and other religious orders and the church at large. The Rule of Saint Benedict is also used by a number of religious orders that began as reforms of the Benedictine tradition such as the Cistercians and Trappists although none of these groups are part of the Benedictine Confederation. Section 17 in chapter 58 of the Rule of Saint Benedict states the solemn promise candidates for reception into a Benedictine community are required to make: a promise of stability (i.e. to remain in the same community), conversatio morum (an idiomatic Latin phrase suggesting "conversion of manners"; see below) and obedience (to the community's superior, seen as holding the place of Christ within it). This solemn commitment tends to be referred to as the "Benedictine vow" and is the Benedictine antecedent and equivalent of the evangelical counsels professed by candidates for reception into a religious order. Much scholarship over the last fifty years has been dedicated to the translation and interpretation of "conversatio morum". The older translation "conversion of life" has generally been replaced with phrases such as "[conversion to] a monastic manner of life", drawing from the Vulgate's use of conversatio as a translation of "citizenship" or "homeland" in Philippians 3:20. 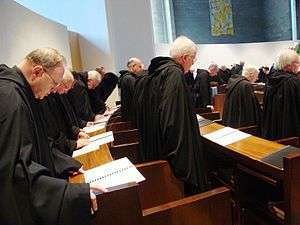 Some scholars have claimed that the vow formula of the Rule is best translated as "to live in this place as a monk, in obedience to its rule and abbot." Benedictine abbots and abbesses have full jurisdiction of their abbey and thus absolute authority over the monks or nuns who are resident. This authority includes the power to assign duties, to decide which books may or may not be read, to regulate comings and goings, and to punish and to excommunicate, in the sense of an enforced isolation from the monastic community. A tight communal timetable – the horarium – is meant to ensure that the time given by God is not wasted but used in God's service, whether for prayer, work, meals, spiritual reading or sleep. Although Benedictines do not take a vow of silence, hours of strict silence are set, and at other times silence is maintained as much as is practically possible. Social conversations tend to be limited to communal recreation times. But such details, like the many other details of the daily routine of a Benedictine house that the Rule of St Benedict leaves to the discretion of the superior, are set out in its 'customary'. A ' customary' is the code adopted by a particular Benedictine house, adapting the Rule to local conditions. In the Roman Catholic Church, according to the nuns of the 1983 Code of Canon Law, a Benedictine abbey is a "religious institute" and its members are therefore members of the consecrated life. While Canon Law 588 §1 explains that Benedictine monks are "neither clerical nor lay", they can, however, be ordained. Benedictine Oblates endeavor to embrace the spirit of the Benedictine vow in their own life in the world. 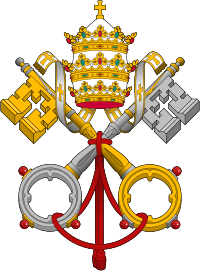 1 2 3 "CATHOLIC ENCYCLOPEDIA: The Benedictine Order". newadvent.org. 1 2 "The Benedictines: An Introduction by Abbot Primate Jerome Theisen OSB. Liturgical Press.". ↑ "Dom Bruno Hicks OSB. The Benedictines (frames).". ↑ Colin Battell, OSB, "Spirituality on the beach," The Tablet 2 December 2006, 18-19. The late Cardinal Basil Hume was Abbot of Ampleforth Abbey before being appointed Archbishop of Westminster. ↑ Christopher Martin A Glimpse of Heaven: Catholic Churches in England and Wales (London: English Heritage, 2007). Examines the abbeys rebuilt after 1850 (by benefactors among the Catholic aristocracy and recusant squirearchy), mainly Benedictine but including a Cistercian Abbey at Mount St. Bernard (by Pugin) and a Carthusian Charterhouse in Sussex. There is a review of book by Richard Lethbridge "Monuments to Catholic confidence," The Tablet 10 February 2007, 27. ↑ Mian Ridge "Prinknash monks downsize," The Tablet 12 November 2005, 34. ↑ Rees, Daniel (2000). "Anglican Monasticism". In Johnston, William. Encyclopedia of Monasticism. New York: Fitzroy Dearborn Publisher. p. 29. ISBN 1-57958-090-4. ↑ "History - The English Benedictine Congregation". benedictines.org.uk. ↑ Kaur, Nirmal (2005). History of Education. Mittal Publications. p. 44. ISBN 81-7099-984-7. Retrieved 1 April 2015. ↑ Wormald and Wright, Francis and C.E. (1958). The English Library before 1700. University of London: The Athlone Press. p. 15. ↑ Savage, Ernest (1912). Old English Libraries. London: Methuen & Co. Ltd. pp. 23–25. ↑ Savage, Ernest (1912). Old English Libraries. London: Methuen & Co. Ltd. p. 26. ↑ "Historique I". st-benoit-du-lac.com. Retrieved 29 November 2008. ↑ "A History of the Popes, 1830-1914". Retrieved 29 November 2008. ↑ Wootton and Fishbourne. Ryde.shalfleet.net (4 August 2013). Retrieved on 7 September 2013. ↑ RGM 2005 OCSO. Citeaux.net (28 February 1947). Retrieved on 7 September 2013. 1 2 3 Fry, Timothy (1981). RB 1980. Collegeville, Minnesota: The Liturgical Press. pp. 136–141. ISBN 0-8146-1211-3. ↑ "The Benedictine Congregations and Federations of North America in the Benedictine Confederation.". www.osb.org. Retrieved 2015-11-24. ↑ "928". Catechism of the Catholic Church. Retrieved 11 July 2009. ↑ "Based on List from Catholic Encyclopedia". Newadvent.org. Retrieved 25 March 2012. This article incorporates text from a publication now in the public domain: Herbermann, Charles, ed. (1913). "The Benedictine Order". Catholic Encyclopedia. New York: Robert Appleton. Dom Columba Marmion OSB, Christ the Ideal of the Monk – Spiritual Conferences on the Monastic and Religious Life (Engl. edition London 1926, trsl. from the French by a nun of Tyburn Convent). Wikimedia Commons has media related to Benedictines.